The 2018 Fall Photo Contest came to an end on Sunday, March 3rd during Photos & Pie, our annual tribute to the photographers. 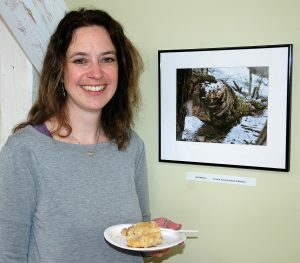 Guests shared pie, cookies, and conversation while enjoying the entry photographs displayed on the walls. The 2018 theme, “The Amazing Life of Individual Trees,” was captured in images that portrayed the tenacity, beauty, and gifts that trees offer. The Adult category winning photograph was of the end of a tree trunk, blown over by the wind, the inner wood visible, soft and rotting. The photographer, Sarah M. Foley named her picture Fallen Strength. The adult runner-up was of a live though leafless sycamore tree. The photographer, Lynn Pelland stood next to the tree trunk and focused her camera upward. She captured the spreading, white branches in the foreground of a blue sky softened by cumulus clouds. She named this picture Reaching. Lynsey Brodeur entered the winning youth photograph, Sunset. In this photograph the sun shines through the tree branches which creates an eye-catching red hue. The youth runner-up photograph was taken by Chad Champoux. It is an lovely aerial view of an orchard at Headwater Cider in Hawley. nowledge R. Michelson Galleries‘ generous donation to frame the four winning pictures. The photos will remain on display at the Bullitt Reservation through the spring, and is available for viewing on most weekdays. We welcome anyone to come view all the entries in person. Call ahead to be sure the building will be open when you visit: 413-628-4485, ext 4.